Australian Rugby Union officials can pat themselves on the back for retaining Israel Folau; but they should also slap themselves across the face for how they have handled the appalling Karmichael Hunt saga. For the Reds and the ARU days on end to stand behind Hunt and not immediately cast him aside following fresh allegations about the extent of his cocaine use last year is beyond belief. News Limited this week published excerpts of Hunt's written testimony provided to Queensland crime investigators as part of a deal to have more serious supply charges dropped at the time. These excerpts - damning reading - implicated several unnamed AFL and NRL players. Hunt was originally fined $Aus2500 but did not have a conviction recorded in March, while the ARU fined him $30,000 and suspended him for six weeks. First up, full marks to News Limited columnist Robert 'Crash' Craddock for writing that the Reds should get rid of Hunt. Craddock wrote: "The Reds should cut their losses and end their destabilising dalliance with Hunt. Hunt's testimony to police, which enabled him to get four serious charges of supplying cocaine dropped, has saved his own skin by throwing others under a bus. But the Reds should never have played along with the soft sentence in the first place. And their decision to make him vice-captain, one which infuriated several senior players, shows how badly they misread the situation. The reality is the continued revelations about Hunt's sordid activities have become like slabs of mud sticking to the Reds brand." How Hunt made the early Wallabies train-on squad several weeks ago is also beyond comprehension. Apart from the bad look, Hunt had done absolutely nothing on the field for the Reds to justify his inclusion. He has looked completely out of his depth; in some games, he appeared to be little more than a passenger. Hunt: the luckiest footballer running around? Yes. Hunt: the most over-rated rugby player running around? He's right up there. Australian rugby needs Israel Folau. 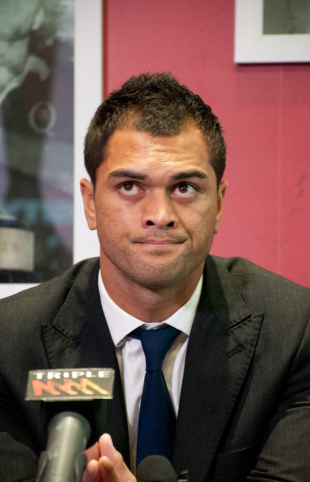 It does not need Karmichael Hunt. Wallabies and then Waratahs coach Michael Cheika was quick to congratulate Highlanders counterpart Jamie Joseph for the South Islanders' semi-final win last weekend, and was heard to say this weekend's final will be worth watching as "the two best teams are in it." He did, however, warn some Waratahs players that their poor performances on the night had put the spotlight right on themselves with the Rugby World Cup looming. Cheika named 18 Waratahs in his extended squad ahead of the Rugby Championship, but Ruck'n Maul understands that several okayer remain very nervous; with good reason, having bombed under pressure. Japanese preparations for their introduction into the expanded Super Rugby competition are in a mess, as revealed in Ruck'n Maul a few weeks back. Now there is a distinct shortage of players interested in being involved. The deadline for the new Japanese franchise to sign players passed this week without a rush of players. The Australian Rugby Union failings continue to mount up, with one of their biggest bungles being the demand that clubs used the flawed Rugby Link online registration and management system. The complaints about Rugby Link are never ending, with many club officials saying it doesn't work, creates more problems that it is worth, and constantly loses important information. One club official said this week: "Rugby Link is an unmitigated disaster." Ruck'n Maul has been told that the Sydney Subbies competition will be getting rid of Rugby Link at the end of this season, and others are thinking of doing something similar. The clubs remain angry because of the endless threats from certain big-noting ARU staff members if they did not sign up to Rugby Link. "Those who were involved should be bloody well ashamed of themselves," another exasperated club administrator said this week. Former Manly centre Mali Hingano found himself playing against former Wallabies back-rower George Smith in the French Top 14 season. Hingano said that Smith, who may yet make the Wallabies' World Cup squad despite missing the provisional 40-man Rugby Championship squad, was in fine form. But he had it all in perspective. "The cool thing was that when I was running out of the tunnel with [Smith], he was saying 'how are you liking it?'.'" Hingano said. "I was stunned and I was thinking how weird it was I could just talk to him like that when we were just going to play against each other. "And then he said 'have a good game,' and I said 'have a good game too,' and we parted ways." A high-ranking official will find himself in enormous trouble if his ARU paymasters discover he has been leaking delicate financial information to a hostile New Zealand SANZAR identity. Those in the know are also aware the official leaked misleading and dangerous information to a certain pressman. His mischievous manoeuvres have backfired big time. Oh no! Our ever reliable Queensland snouts claim John Connolly now has his eyes on his old job as Reds head coach. Even the snouts sound distressed about this crazy development. But it appears that 'Knuckles' did not help his cause at the team's post-season celebrations. Very interesting footage circulating of a high-profile Australian official and bizarre behaviour in a ground corporate box. No wonder many are keeping their distance from this volatile official. An ARU foot soldier has upset colleagues and those who have to deal with him, as he is very ambitious and ruthless towards anyone who stands in his way. Despite him constantly saying he is very close to a very influential figure in the St Leonards bunker, however, the truth is completely different. A notorious past official known as a 'Fish Flinger' appeared from nowhere to attend the Waratahs semi-final, and at the end of the night was in his usual "tired and emotional" state. But he failed to avoid getting a "royal spray" from a former player who for years has despised him. A very bizarre situation has emerged where a broadcasting figure has been complaining to RUPA over an upcoming player exodus. Finally, was a player very much in the news at the moment really kicked out of a Queensland casino recently - along with a wannabe Wallabies flyer?